My daughter, Olivia, recently returned home from university for the summer and she’s been bugging me to buy more fruits and veggies. Who is this girl? She’s changed so much from the picky kid who would never eat her veggies. The good news is that our local Farmer’s Market opens this weekend and stays open until October. Hello fresh fruit and veggies. She’ll be in her glory (and if I’m being honest, so will I). 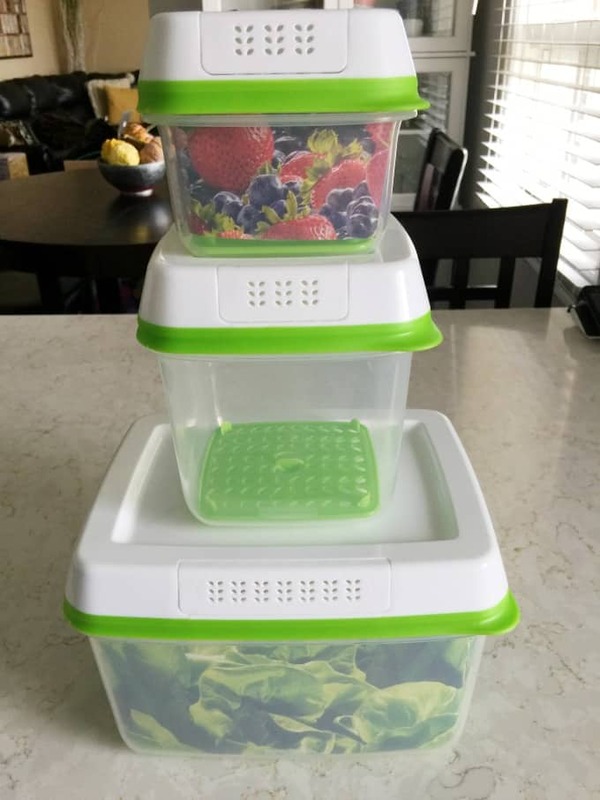 I’ll be storing all our fruit and veggies in Rubbermaid® FreshWorks™ containers. Why? Because they are the best, in my opinion. I used them last summer for all our produce and I’ve got several more now to handle Olivia’s new healthy eating changes. My fridge will be FreshWorks™ city in a few weeks, I imagine! The frugalista in me appreciates that I’m not wasting as much food. Groceries aren’t cheap these days so I want to make sure that we are eating everything I’m spending my hard earned money on. Think about how many times produce has gone bad in your fridge. Maybe you forgot about it or you bought too much and didn’t eat it in time. It happens. I hate throwing food away because it’s like throwing away money. No one wants to do that. Not only the money thing, but rotten produce is just nasty. Fuzzy strawberries anyone? No thanks. I want my food to stay fresh in the fridge and be just as delicious a few days later. 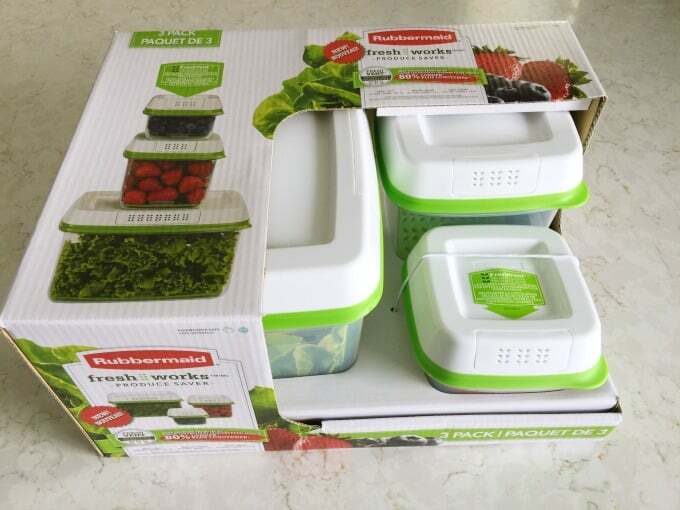 Rubbermaid® FreshWorks™ keeps my produce fresher for a longer period of time. I remember picking up a bunch of fruits a few years ago to make a fruit salad. I left them in the fridge in their store packaging for a few days thinking they’d be ok. I went to make the salad and found out some of it was rotten. Not only was I grossed out, but I was upset that I wasted my money. I was really craving fruit salad too, but felt too lazy to run back to the grocery store. First off, let me start by saying that you won’t find another container with this same technology. 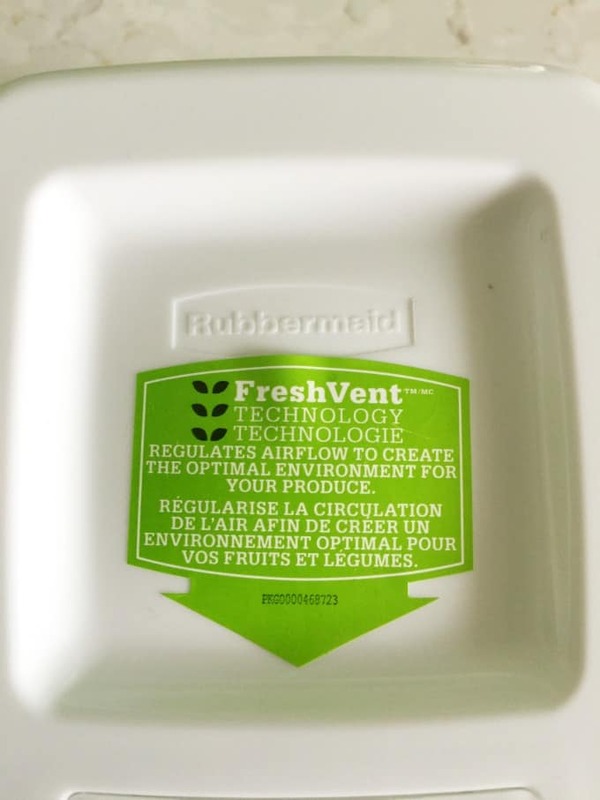 On the lid of the container you can see the little holes that are called the “FreshVent”. It allows oxygen and carbon dioxide to flow through keeping a happier environment for your produce. 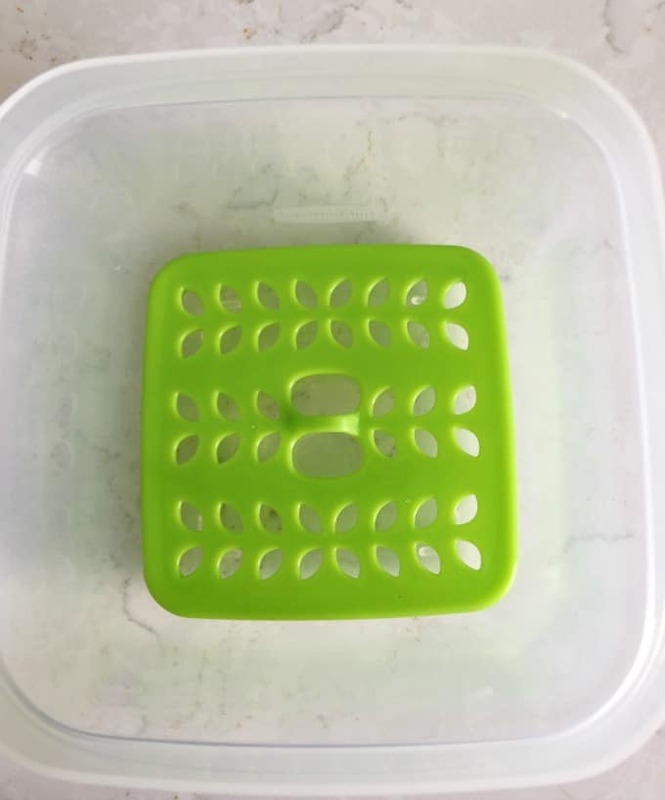 When you open up the containers, there is a green tray with more holes in it that fits on the bottom. It’s called the “CrispTray” and keeps your produce out of the moisture that sometimes pools at the bottom of regular containers. It also allows for more airflow. They come in three different sizes. 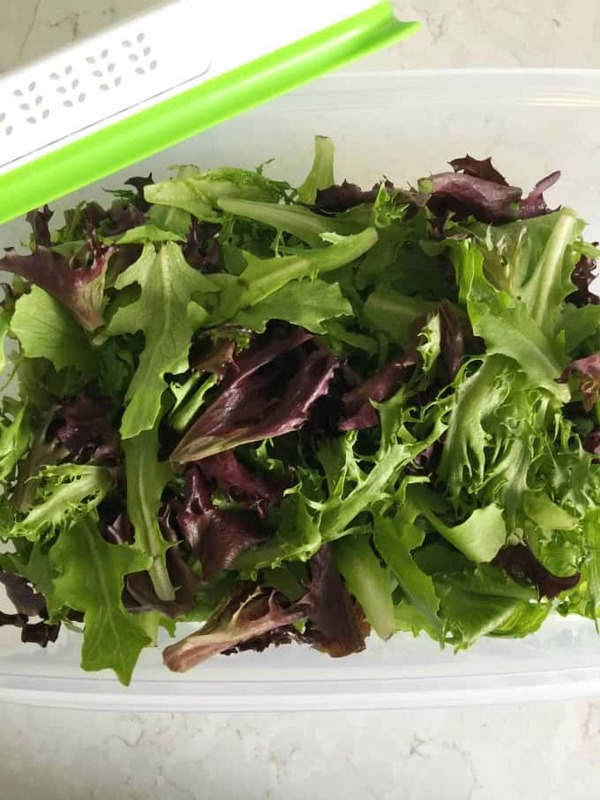 The large size holds 17.3 cups and is perfect for your fresh lettuce. I love to serve salads with every meal in the summer. I can easily grab a bunch from the container to add to a bowl for our dinner. 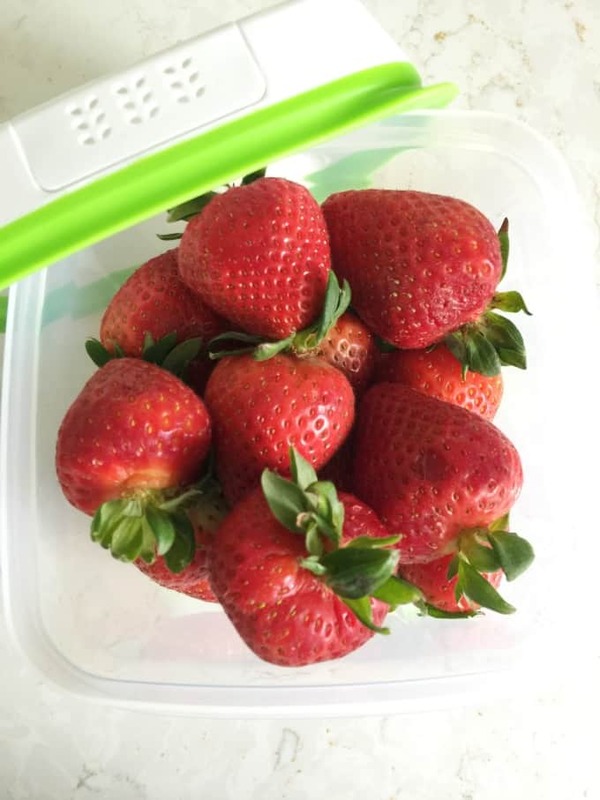 The medium container is great for strawberries and holds 6.3 cups. I take them right out of the store container and put them in my FreshWorks™ containers as soon as I get home. The girls have been eating them like crazy. 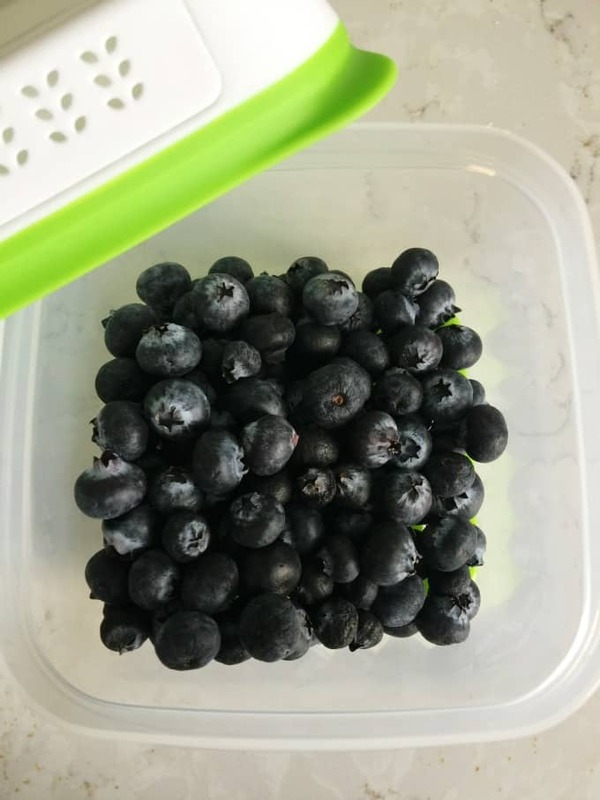 The small container is 2.5 cups and is ideal for small berries like blueberries, raspberries and blackberries. We pick blueberries at the local blueberry farm in the summer months so I’ll need to get some more small containers. Olivia puts blueberries in her yogurt for breakfast. I like making blueberry pie! They even stack neatly to store in your fridge. I also like that they are clear so you can tell at a glance what is inside. For cleaning, just put them on the top rack of your dishwasher or wash by hand. The green tray is removable, but the vent on the lid isn’t. Just leave that be. And hey! You can save money with this $3 coupon. 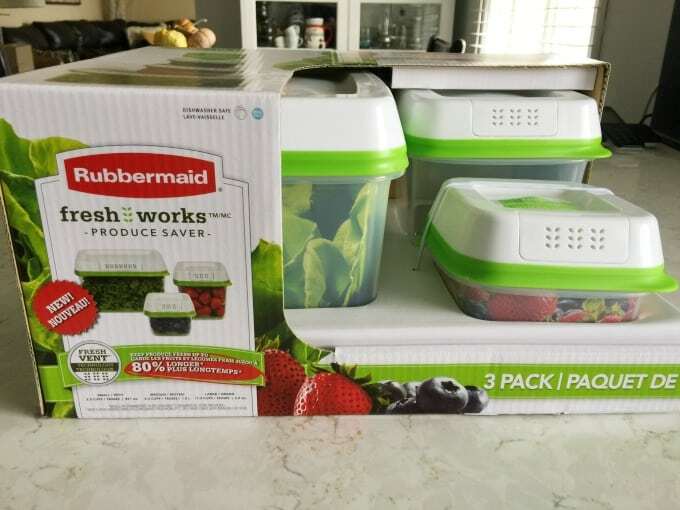 I hope you’ll give Rubbermaid® FreshWorks™ a try this summer. I’d love to hear what you thought of them! Wow, this is going to come in super handy when we are living on our boat – especially for the Pacific Crossing! More vegetables for longer! Thanks! I have to give these a try! I have a terrible time using up our produce before it goes bad. These sound great. I NEED to get these! As much as I hope that we will eat all the fruits before they go bad, it doesn’t always work out that way! I will be looking into this for my fruits and veggies! I’m all about keeping my produce fresher longer! I don’t have these yet, but I need to pick some up. I’ve been using those produce bags that are supposed to keep produce fresher longer but I hate washing them and having them sitting on the counter to dry before using them again. It is so nice when your kids grow up and embrace the things we do like a healthy diet. 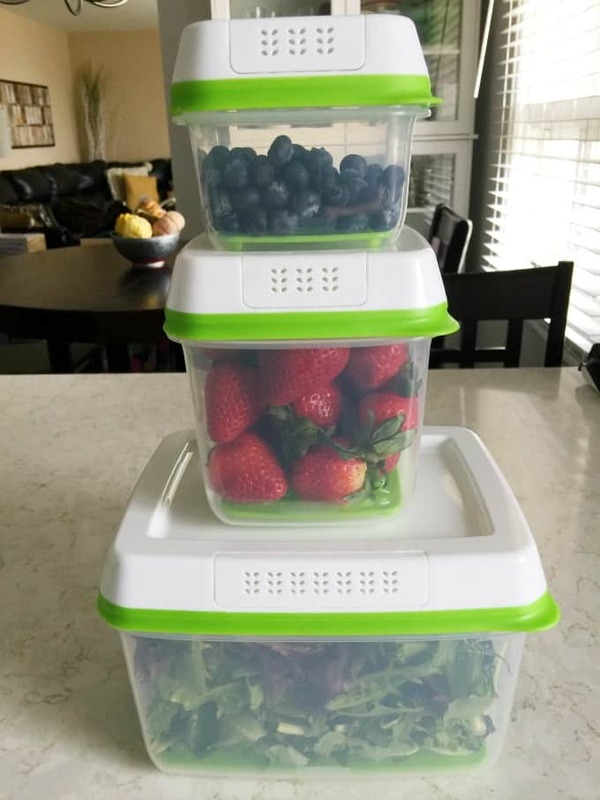 These containers are real life savers when it comes to keeping produce fresh and having less waste. I think this produce system is amazing! I also have one and do enjoy that it keeps my stuff fresher, longer!! These sound great! I buy lots of veggies and fruit being on Paleo diet. This sounds like a nice way to store and keep foods fresh. These look great! They are perfect for the upcoming farmer’s market hauls I bring home every summer. I buy so much because it all looks good and then it all goes bad. I’ll have to try these to see if they make a difference. Thanks for the tip! These are some great tips for keeping fruit and veggies longer than you would otherwise. It also is a great money saver because of so much less waste. I have a set of these and can attest to their amazing super powers!! They seriously save me so much money on produce! Oooh, I need this in my life. We often store our produce in containers. I love the sturdy lids on these! We have these and they have seriously been a game changer in my kitchen! Before these I wasted so much money on fresh produce! I love to stock up on fresh fruits and veggies. I hate to throw any away it can really add up. I will have to pick up some Rubbermaid FreshWorks containers. With summer here we definitely eat more fruit. I have a set of these and I love them. I am adding more fruit and veggies to my diet so I will need to get more. The coupon will come in handy. I love this! We’re a family of seven so we buy a lot of groceries each week. I spend so much time properly storing the fruits and veggies. This would help so much.